level select slider from Robert Toone on Vimeo. This video above shows something I like. It is my new scrolling list. It uses several different methods in a happy union for control. It has taken me severla days to get this done right. I coded it very quickly at first but it simly didn't quite work right between modes. So I redesigned it and went to code it yesterday, only I found that I could code it even better. Now I have a fairly simple algorythm using less variables and less code than before. As you can see above, the list can be dragged by a finger. Then you can swipe and fling the list along at a nice pace that dampens and slows over time. Finally the list will go into a mode once you are not dragging and center the selected item. It also allows someone to stop a fling by touching the screen. Now it sounds easy once the elements are described, but getting them into a nice cohesive design is important. I am very pleased with this UI element and will be using it all over the place like the new Code entry screen I need to write. Rival game to Hoop Fighter? I have not really been in this position before, and I am surprised to find I am in this position now. I have a Rival game, one that has recently been published and one that features Zombies. Now what could posibly make me call any game a rival game? Is this like the movies where they seem to come in twos and threes. Lets do two movies about Magicians... or several about Zombies.. etc. In this case my game development does indeed have a rival and although it features Zombies, it also features a much larger than life matchup in the form of Shaq. Yes, he has just had a game released that features himself and Zombies. Where he goes along bashing zombies into.. dust ? The games name is Shaqdown where Shaq gets to take down the zombie infestation. Here is the link to the homepage for Shaqdown. It has the intro video alongside some gameplay footage. It is a side scrolling game.. dang, so is mine. I had designed a move called Ballistic, but Shaqdown has something called a freethrow (same result). Voice acting by Shaq in both games. Both have an intro video, but Shaqdown is more anim comic than FMV like Hoop fighter. Shaqdown is 99 cents, Hoop Fighter should be free. Both games feature in game transactions. Shaqdown has most of it's gameplay dedicated to some nifty jumping up and down the 3 platform levels. Hoop Fighter is a single level featuring multiple ways to attack or dodge. Shaqdown has bosses. Hoop Fighter does not, unless it is successful, then hopefully I will get to add some (I love me some boss battles). One review mentioned that they though Shaq was a replacement for 'Adrian Peterson' or some major line backer. The review is here. Damnit they have Zombies... Can I compete with that? Hoop fighter won't be out for a number of months, so that is why I feel this game is more a Friend or relative rather than a real rival. But I hope it stirs up a frenzy in the Shaq devoted to see more games featuring the larger than life star. Although this won't seriously effect my development, I do believe we will redesign the Ballistic attack feature. Posted by VoodooChief at 10:50 AM 0 comments Rival game to Hoop Fighter? Developing for the iOS is usually done on a Mac... and I am not a Mac person. I don't really want to buy such an expensive machine to work on for just my development either. I should point our here that I have so many PCs and that is also what I work with at work writing games. So moving over to a Mac which I have hardly used in many years would take some level of learning curve I do not want to pay. 1. Uses C++ (and other languages if ya want). C++ is the language I tend to use at work, so this is an easy move. 2. Allows me to create iOS games on my PC.. What, really? No freakin way I thought. At the time I was not aware of any other SDKs allowing this type of thing. 3. Thier library and functionality is very extensive, yet simple enough to see how to use it. 4. That last one meant a quicker learning curve to me, and that was important. Now here I have been developing on the iOS devices and having to jump through all those hoops that Apple makes us do to work on a device. I mean creating a provisioning file and signing your apps and setting up the certificates etc. Well ya have to do that really and it isn't truly straight forwards until you have done it a number of times. The one thing though that I have gotten used to, but still dislike as I make mistakes, simple human error things. That is to drop the build onto my iPod or iPad. The procedure itself is simple, build the app, deploy to create an ipa file. Then drag and drop it onto the itunes program. Only when you have a version on the iPad, you must delete in both places at the same time, then sync, then put the new ipa into itunes and sync once more. Simple, yet the amount of times I forget to delete at one of these points is amazing haha. This of course gets multiplied by the number of iOS devices I am trying to test on... and then there is also getting my friends setup with this same procedure. So now I have found an easier way. Yes, that's correct I am starting off with a positive experience quote! I heard about testFlight a while ago via twitter and my many knowledgeable peers on there. However I really didn't want any more expense at this time, and I also tend to use maybe 5 testers, so would it be worth it? So lets look at some of the points I just raised. 1. Cost. When I went to the www.testflightapp.com web site on Wednesday I just couldn't seem to find the cost of using their service. Reading up it sounded interesting as well. So I asked in a tweet about the cost, and I got several responses. My fave being that that they don't know how testFlight do it, but it's free. Whaaaat? I musta misread yeah? Only not so, I got anumber of tweets telling me it is fully free. How they do this I don't know, but it made me take action to look into this system faster. 2. Worth it time wise? Well the setup for my account was Very quick, it is also nice and easily laid out so I didn't have to think very much about the next question or what to click next. Excellent start. Then I setup my iPad as my device and whammo It was asking for a build. Within 30 minutes I have my iPad downloading the game from the internet. Wow and Yes, it was worth it. As my second update was done very quickly. I can see how this would make even dealin with 5 testers much easier and faster. I have gotten several of my testers and teammates now signed up and the so far it has gone quite smoothly. This is an excellent looking service and as it happens testFlight are also Beta testing their system for the Android as well. Maybe I'll try that next, after I get this iPad game done. The only mark I can place against this system so far is a few of my testers have mentioned they didn't find it obvious that they had to setup a device and how to for their account. Once I told them they had to have one they did not take long to address this situation. Here are some important Twitter name for you to follow @testflight @scootdown. Thanks testFlight I really appreciate your setup and your simple and obvious to use web site and system. I thought I would post this snapshot above. 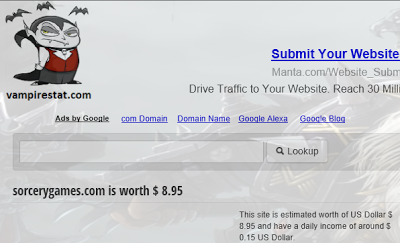 I got the link from this Blog sites feed statistics and I wanted to check it out. When I got there (www.vampirestat.com) I just had to enter my web site to see what it's estimated value was. I was not surprised to see it being low, but less than a years subscription was funny. Though it does not really have a lot of traffic, or Ads etc. Of course my main company web site is not about what it sells.. nothing directly. It is about having a home that people can go visit to see what my company is all about. Perhaps even learning about a game that they might get excited about. Now ya gotta go try your own web site haven't ya? Posted by VoodooChief at 8:00 AM 0 comments No Value? Scrolling 3d court from Robert Toone on Vimeo. Above is the video of the new basketball court floor. As you can easily see it is so much better than the previous 2D scrolling backdrop. Now I have a nice Full parallax looking floor. I will be adding in the crowd/stands next and the edge of the floor paraphernalia, such as the chairs I had before. I will also be adding some advertising banners. Which excites me, as I can use them to advertise or plug my own company along with the others responsible for the creation of this game. Oh, I should mention this is the 3D polgon that has a repeating wood texture on it. then I simply move the large Quad/polygons to the left and modulo the movement by the size of the texture, in this case a 512 x 512. Some days it seems it isn't worth coding. Some days it appears I am quite incapable of coding, or maybe it is a case of some days mixed in with tiredness. Either way yesterday was one of those days, or nights to be more precise. My day went well and I pounded out a lot of stuff for my day job. Then I went home and did some house mods in the kitchen to get the dishwasher installed, this turned out to be a pain and took a couple of hours. Eventually however I got to sit down with me cuppa and my laptop. Time for some coding. The task I had set myself was to get the polgons in place for my court flooring. If I did it in 3D I can easily move it as Kal (Shaq) runs along. Doing it in 3D will give me the depth and more importantly free parallax effect I so desire to make this look good and dynamic as we scroll along. Now I could of course get art to create an animation that does the same thing, but alas in this day and age this technique appears to be forgotten, and explaining it especially to someone whose second language is English (and I don't speak any other languages) is simply too problematic to deal with. So doing it this route is the best as it give me a lot of control and all I need from thr artist is a nice wooden floor texture. So it was quite late when I started working on placing a nice Quad onto my game screen and then texturing it. It went well enough on the initial creation, where I simply try to get a quad created and not crashing my runtime code. Then I wanted to see the Polgon featuring Kals face. I simply couldn't get it to show up. Still I persevered for way too long and eventually I managed to rotate it across the screen. So I presume the Quad was behind my camera. However after another hour of trying to get the stupid thing to show up on the game screen properly positioned I had to call it defeat and headed to bed. This morning however I booted up the laptop to look at it and immediately realised I had been changing the rotation parts of the matrix and not the translation.. Oh how frustrating, but oh how satisfying to see my polygons on the screen. hoop fighter video on the ipad from Robert Toone on Vimeo. That above is the proof that a my video playing is now working on my iPad. The video in question is a very small excerpt of the into I have been blogging about. I am very excited that I have converted this to a small size, but also looks great on the iPad. Although this player is playing via my test app that I create from an example from the cross platform development SDK www.madewithmarmalade.com. It is my understandig that it in fact uses the native video player. I spent some time yesterday working on the video replaying aspects of a test app that I have. This time I was working on a version for the iPad. Hoping to have better results than I have on the PC. So there we are a Ford F350 with its bed fully loaded a packed with 4 off road bikes. also the helmets and gear and boots are packed into the bed as well and all tied down or bungeed down. We bought plenty of Gas and it was off to new adventures in a place they call Cal City, about 130 miles away from where I live. Once we got Gas and Diesel I let my lovely wife take over the driving and I sat in the passenger seat. Once we were on the freeway I got out my trusty new laptop (can I say trusty and new about the same thing? ), and turned up the brightness and it was time to work on the iPad video playing app. Well I have a few things to mention about using a laptop while in a vehicle travelling along a freeway. Number 1 is that it is a lot more bumpy than you would realise, and that is a bit of a pain, but not too bad. Secondly the sun is a major factor depending on exactly what direction you are travelling in as well as what time of day it is. I am sure this would be much easier at night. So there ya go.. I was being driven to the middle of the desert while I programmed. As the programming was going well I was soon attaching my iPad to the laptop and installing the test app. As it happens it all went swimmingly and it looks ok.
Next up is for me to create my own video and play it on the iPad. Once that works I can see just how big this intro movie is going to be. My best guess is that it will be several times larger than the actual game itself ! I have just seen the opening sequence, or introduction video created for Hoop Fighter, it is simply awesome. IU love what I saw and am very excited by it. So what can I do with this excitement? Well I was excited to do more coding, but also one of my friends asked several months ago if I could do video on the devices. I answered that it will take up a lot of memory or size, but I wasn't ure at the time. Now after witnessing this video and also I got a comment from my friend Scott... I need to get some of this good stuff in my game for the iPad. I have been playing with the video demo from Marmalade, only it won't work quite right on my windows laptop. But I can try it on the iPad, where it is supposed to use the native video player. I just hope this works, as I see and read a lot of caveats about how difficult it can be. Time will tell. But if I can get it working I'll even do an excerpt video for everyone to see it working. So far I have spent an hour on it with no luck on the Pc, so onto the annoying iPad I go. Here is a short video showing my test level and the end of level minigame that takes place. This minigame will determine you level multiplier, so make sure you hit those basketballs as fast as possible. Only with the mouse pointer AND holding onto my camera, I sucked bad. (my excuses!). The timer starts and happens to be the length of the Dunk animation that Kal will perform once I have one, and in that time the player must touch each basketball that appears. there is a set number of balls to hit on each level. Once that levels balls are all accounted for, then the level ends, but more importanlty the countdown stops, and that is your level multiplier. On later levels the number of balls to hit will most likely go up, but also we will introduce more dunk animations which will have different timings. dunk it from Robert Toone on Vimeo. I know the video runs slow. That is becasue this is a video of the simulator and NOT the iPad this time. That is the short answer. I am not sure I am really happy. The information io not like the package list I have on the right side to scroll through. 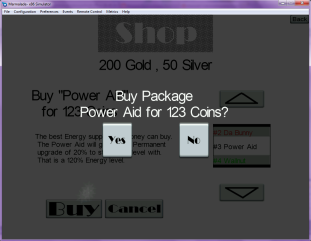 However when I started this I realised I had several options on how to display packages for people to buy. One thing that annoys me in other games is a nice picture of a package, but I cannot tell what exactly I am buying. I of course added a description, so I do not have that exact same issue. I also use the name of the package above it's cost. So why don't I like what I have. Well It needs graphics for ech package, and when that is resolved I can have them instead in the scrolling list. That will look a lot more professional and interesting I suspect. Thuogh the real question is.. is the scrolling list the real way to do this? I am not sure. I suspect when I get the real graphics for this screen I might make soem modifications to the buying package list. Maybe make it a stack instead and scroll left/right ona flick gesture, adn get rid of the arrows. It seems I have some time to research a better or preferable way to do this. Now I need to get on with maybe the codes screen. As last night I completed the addition of the shop to the in game pause screen. Posted by VoodooChief at 11:47 AM 0 comments Happy with my Shop? When I design my menu's I tend to design them more from an overview standpoint rather than a documentation of all the features menus have. For example the Shop menu is designed in a basic way showing some example layout, but more importantly it lists or shows through some bad sketch by me what essential information I need to display. What does that mean 'essential information' ? On this menu I needed a title and a back button, very essential to know where you are, also it is essential to have a way to easily navigate back from whence you came. Then I get to the more optional stuff and the reason for this screen. 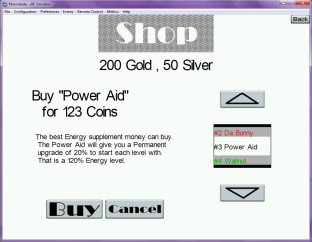 It is a Shop.. so I need to tell the player how much money they have, and also what they can buy. However that is mostly where my design stopped. Lets fast forward a bit in time now to the present day, or I should say the last few days. I have been coding the shop now for several days and I got the essentials setup pretty darned quickly, and I am now working through the details of the screen. It's sort of funny, but setting up this menu went very quickly, yet finishing off all the details is taking probably 4 times longer. Now I could have simply left this screen in it's initial working state.. yet, that doesn't sit too well with me. I know some people stop when something is working, but there needs for some screens to be made more friendly, or extra information that could be displayed with a few more minutes of development time. So lets get to some pictures of what I am talking about. The image above shows how I laid out all the essential elements. It also shows some of where I have been spending more time, polishing and making the screen more friendly. You can see the listing column has colored text in it. Those are the package names and they are now colored to indicate that 'Green' you already own, 'Red' you cannot afford and finally 'Black means you can afford this item and you do not own it. You may also notice that the 'BUY' button is 'Red' at this time. That is because I have an package selected that I cannot buy. The Red BUY button is also not selectable. In this image you can see a different story. I have selected a package I can afford and do not own. So the BUY button is now Black (normal state) indicating I could buy this package. My final image of this post is after I have pressed the BUY button. As you can see I low light the previous screen and overlay a new requester on top. Now I don't tend to like asking for confirmation of stuff in games all over the place. However in some circumstances it is very important. Times when people are about to spend their hard earned Gold is one of those times. So I ask for confirmation, making sure to tell them again what they are about to buy. Now there is a possibility that we could put too much information on these screens, and it can be a tough balancing act to get the information that a player might want and not put on extra distracting information. One thing you might be thinking is that this menu is still not done, and you would be correct. You may have noticed in fact that when you have an un-buyable item selected the Cost text STILL says 'Buy', when it should not say that. I will get to these details as I can, but I do like to make this kind of interface as natural seeming as possible. as you can see, I spend a lot more time fiddling and finishing a screens elements than I did with it's initial layout/design. I don;t let not having professional graphics stop me from coding. After all I would never get anything done, lol. Still these are my test and work graphics and when I get the real art treatment I will come back and hopefully the screen will look a lot nicer and more balanced. One of the key features of the game is the ability to expand your gameplay experience from within. This is going to be done in two different ways in Hoop Fighter the game. One of them is a shop, a place that sells many wondrous tings to enhance and expand your gameplay experience. I am about to write the shop menu as I type this up. I already have the whole design, though I am sure I will tweak and enhance it as I code and test the menu itself. I am starting off with the code base I have created for the Level Selection Menu, and I will use that as a good solid base that does most of what I need. Then I shall build all the extra stuff on top. Things like the selected Item needs to display a description of what it does to the game, alongside the cost of this item. I think shops and the things they sell can make a big difference to a game, though not for everyone. Still I shall try and come up with a broad range of enhancements to suit as many tastes as I can. I am a bit lazy sometimes and Andreas made the Texture Packer work even when I have not purchased a License. So there I go and create an exporter for it and everything and actively use it for the last month or two in my game, but never seem to get round to buying it. Well now I have. This post is mostly a plug to say anyone developing a game that requires textures should get themselves a trial copy of Texture Packer and see how much this can improve your game. It has certainly helped mine in so many ways. Downloaded the game to the iPad last night and it ran approximately 4 times faster than I want it to. So the scroll goes whizzing by and the enemies trigger at heroic speeds. It seems I need to alter the game code slightly to prevent faster than desired gameplay. I tend to think of this running fast problem as a good thing, as it is Always easier to slow code down than it is to make it run faster, and optimizing code is something I have done now for 20 years. So of all the performance problems to have, well, I would take this one each time. It also means I can add a helluva lot more eye candy to the game without worrying about slow down. I was going to take some video to show this problem off, only.... It simply looks like gameplay footage played back at a faster rate. Should I or should I not bother, well, maybe later today. There are generally two ways to fix my speed up problem. One is to pass along the time delta for this update to your update code and multiply it into speeds and timers etc. This has a great effect of smoothing out the frame rate from every angle. However all those dang multiplies add up (they do in my mind, I have developed on some crappy machines I can tell ya). I usually go this route and have for my last 7 games or so, be them on the Xbox, WinPhone7, Android or iOS devices. This time I am going to go a different way. I am going to collect time and when a 30th of time has been accumulated I will pass through and call my update (logical) routines. The benefit of this is it really makes writing the logical code so much simpler. Time can actually be counted in frames as well as erm.. time. The best part is the whole game looks fine apart from the speed it runs at. It looks exactly like the emulator, except for some reason better all over. I am not sure why, maybe it is the quality of the iPad screen or something. Posted by VoodooChief at 10:20 AM 0 comments Super fast! As I previously mentioned I am busy working through menu coding. These menus have been designed now for several months and it's time they worked. I tend to start on menus when I need them, for the flow of the game. For example when a player dies he needs to go somewhere before being able to come back and start a new level. So I tend to code the Game Over screen after the Main menu page. 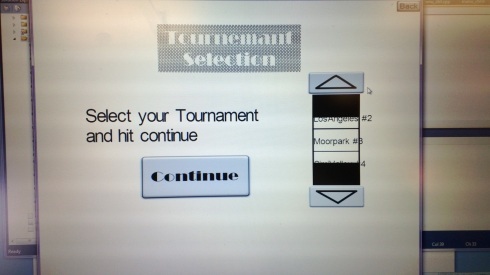 After that it is what is needed, such as a level select screen, great when working on gameplay for more than one level. As you can see I wrote this so I could select one of several levels. The whole screen works including the back button. I enjoyed writing the scrolling name in the window, which as you can see needs to be a bit wider with that sized font and length of place names. I have suffered this last week, got the Flu along with a chest infection and sinus problem. This has knocked me about pretty badly and took me away from my day job as well as anything else for the last week and a few days. I am now well on my way to a full recovery and perhaps in a few days I will feel fully recovered. But what does that matter when there is development to talk about. I have not done anything while being ill, yet these last few days I have managed to pull the development cycle back into soem form of progress. I will have to make a video of what I have been working on. So expect updates over the next few days as I work on Hoop fighter and also blog once again about it.